I sewed the last 8 blocks, 4 of each of the two shown, and 6 pinwheels. 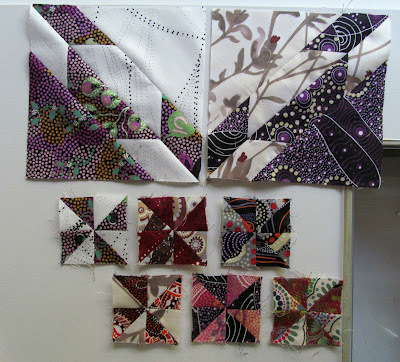 Looking back at my previous post of the other blocks it looks like I need to find 4 more fabric combinations. I'll work on that today. 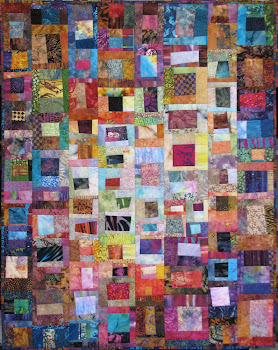 I used 5 of the 6 new pinwheels to add 2 rows to this little piece. 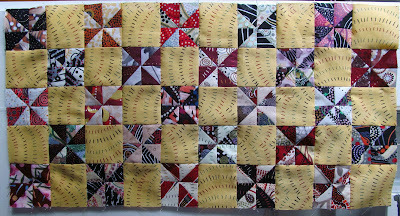 At 10" x 20" it is almost a table runner size. With 4 new combinations plus the 1 pinwheel left over I will be able to add 2 more rows. I want to clarify the 6" distances that I mentioned yesterday. They are 6" from the pacemaker, not from the rest of me. If you hold a 6" ruler in front of the area below your collarbone on the left side of your body you can see I'm more than 12" from the sewing machine motor which where the interference with the pacemaker could occur. Being too close could cause dizziness or heart palpitations. Magnets are a danger too. Anonymous, you want me to go back and label all of my 16 patch block posts. I intend to do that someday but it will probably take about 4 hours to search for all of them. If you want to find the 16 patch posts go to the search box at the top left corner of my blog and enter 16 patch. It will bring up any post where I said "16 patch". If I had known I was going to make so many of them I would have created the label with the first post. Lesley--on my view the search box is top left just above the Exuberant Color header and next the Blogger "B" logo. Wanda, Hope you are much doing better, I having been following your blog for a while and really enjoy it. I love the new blocks...especially the purple one. Great fabric! The pin wheel blocks are just so neat! Hard to believe they are bonus. I love the Australian fabrics and what you're doing with them. Thanks for posting some of the rules about the pacemaker - frankly, I did not know any of this. The only restriction I remember my husband's doctor telling him was not to do any weight lifting with his hands above shoulder level. I will have to discuss what you mentioned with my husband. 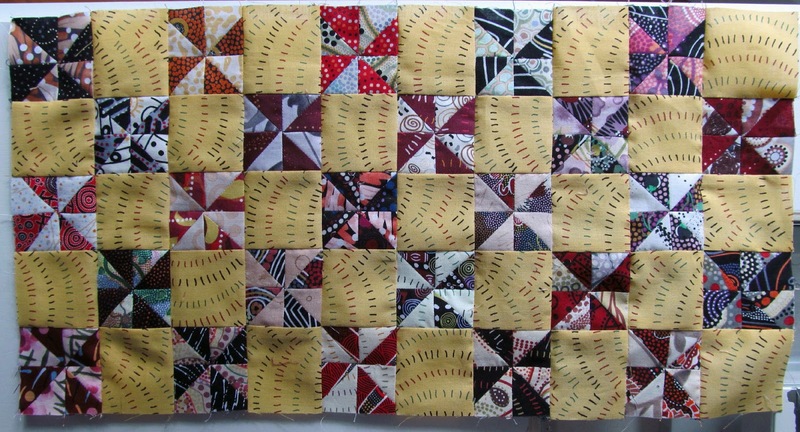 That yellow fabric for the pinwheel patches makes for a fabulous combination! I am glad you are able to at least do some sewing. Pinwheels in the sunshine = happiness . (*._. *) I do all my sewing through you ~ and boy are we getting a lot done. 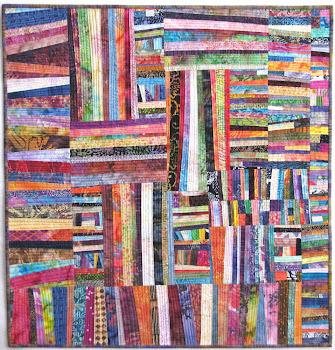 I can't wait to see your Hunter's Star quilt - I think it's going to be quite stunning! The pinwheel top is so very cheerful! The Australian fabrics show off beautifully when cut and sewn up into block, some fabrics lose the impact, these don't. Those tiny, tiny pinwheels are just little treasures. Good news about the 6" then. That's not so bad. Still a lot to remember. Thanks for the mention on the 16 Patch. I looked for a search box and didn't find it. Now I know, duh. Thank you and take care.